Humanity’s fondness for animals encourages the circulation of reports involving the heart-warming stories of amazing animal rescues. Around the world, people often come together in hopes of saving a helpless creature in danger. Raging storms off Australia’s Gold Coast stranded approximately 130 baby bats. Workers from the Australian Bat Clinic and Wildlife Trauma Centre found the month old infants covered in fly eggs. The severe weather forced adult mother bats to flee for safety. The youngsters, left to fend for themselves, foraged for food on the ground, which made them vulnerable to predators, parasites and illness. Rescuers swaddled the little ones in dusters, placed them in plastic containers and returned to the centre where volunteers hand raised the bats. On December 2008, cameras positioned over one of Chili’s busiest highways caught an amazing act of heroism. A stray dog wandered onto the freeway and became the victim of an automobile collision. Stranded and injured, the animal lie on the road. Another dog appears and using his front paws, grabs the upper body of the injured canine. Inch by inch the second dog makes his way across the road to safety with his friend in tow. Workers nearby ran to assist the dogs and sought medical attention for the injured animal. In a bizarre twist of fate, a three-year-old toddler left his mother’s side, climbed a fence and fell into the gorilla enclosure at the Brookfield Zoo in Chicago, Illinois in August of 1996. Lying unconscious at the bottom of the enclosure, a young mother gorilla, having her own youngster on her back, approached the child, picked him up and moved away from the rest of the primate population. As zoo visitors watched in amazement, “Binti” carried the boy to an access door and cradled him until zoo workers arrived. While retrieving crab traps near Cape Canaveral, Florida in 2005, fisherman found a baby dolphin caught by her tail in one of the traps. They took the young female to the Clearwater Marine Aquarium. Surgeons made the decision to remove the mangled tail. Prosthetic specialists from the Orthopedic Group in Bethesda, Maryland became involved in saving the dolphin. The team created a unique tail fin from plastic. After repeated refusals to wear the device, the specialists developed a gel to mount the prosthetic comfortably in place. The team later implemented the innovation for Iraq War veterans. The amazing story also influenced the making of the movie “Winter”. Peter is a Leading Veterinarian from Sydney, Australia. He says that is amazing to hear some of these incredible animal rescue stories and believes it is important for pet owners to take out veterinarians insurance to cover their pets in case of an accident. This are inspiring stories on people who stepped up to save animal lives. 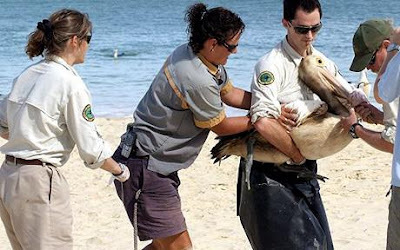 These are such heart-warming events unfolded between animals and human. Good to hear that there are truly committed individuals who did these great jobs. It always interest me to watch these kinds of happenings. It's good to know there are people who engage in preservation of animal lives. Live and let live, so they say, our furry friends and aquatic friends need to live in harmony and in peace too....and not just survive - kudos!